Keeping the same in mind, I decided to create a Christmas wishlist from one such fashion-forward website, Zaful, for you to either uplift your own winter wardrobe or gift something to your loved ones. 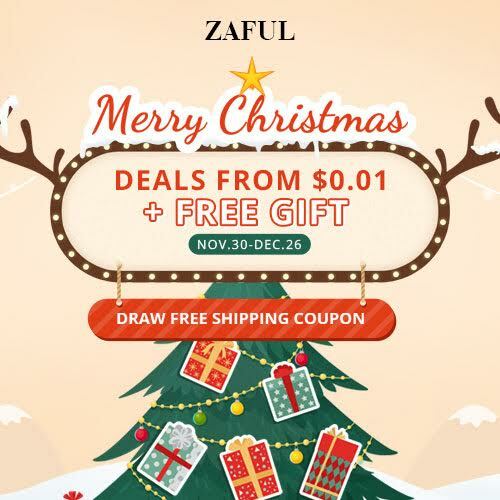 Shopping at Zaful comes with its own set of added perks like right now, they are not just offering worldwide trending outfits but with some amazing Christmas deals that you wouldn't want to miss! Suede & winters go hand in hand! I have been loving this fabric off lately for the retro vibes it exhibits. So when I saw the variety of suede jackets available at Zaful, I knew these are a must-have in this season's wardrobe. From cropped to the biker, you name it & they have it. Being a sucker for casuals, winters without pullovers are a big no for me. But we need to get over the regular 'ol boring style & make space for dope versions like chunky knits, pearl embellished or lantern sleeves. And for this holiday season, I picked this off-white cable knit sweater for an easy Christmas look. All of us must be owning many pairs of boots to flaunt in winters, but the kind of styles offered on Indian websites are quite limited & getting them imported from abroad will definitely cost us a bomb! But thanks to Zaful's Christmas Sale 2017, I can pick statement pieces like these for as low as $40 (INR 2500). Easily lift any basic outfit with these, eh?! I have been hoarding trench coats for quite some time mainly for its versatility. They are timeless & elegant and can be styled in numerous possible ways. Make sure you own one. Faux Fur has been trending a lot currently. It not just provides utmost warmth in this chilly weather but adds a luxurious vibe to your look. Dress it up or down, you can never go wrong with this style. So these were my picks for Christmas this season! Let me know your favs in the comments below. Till then, Have a great holiday season.